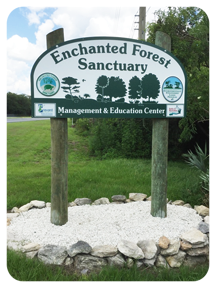 Enchanted Forest Nature Sanctuary, Titusville Florida - Walks, Guided Tours, Schools, Ecotourism. 1/2 mile west of U.S. Route 1, in south Titusville. We have many family events every month. Click here for the details. Interpretive Tours: Saturdays at 10:00am. specimens is prohibited in the Sanctuary. This Gopher Tortoise is no ordinary turtle. His burrow provides a cool Gopher Tortoise Motel and Restaurant. It is critical to the survival of many local critters in the hot sun and during the periodic fires that are needed to maintain their Scrub home. Our friend is the basis of one of the most complex interdependencies in the Florida Scrub. You will descend 15 to 20 feet from the desert-like Scrub on the ancient Atlantic Coastal Ridge into the shadowy, moist Mesic Hammock with its huge canopy. The interrelationship of elevation, soil, water, nutrients, and botany becomes evident. The plants of the temperate climate overlap with the plants of the sub-tropics in an unusual display of vegetation. You are on an Isotherm. General Hernandez built his road through here in 1837. The potentially devastating Addison Canal (1912) fortunately met its fate in our Coquina Ridge. Sitting under our Ancient Oak, listening to the birds, may make your mind wander back to the days when the Ais Indians, or even "Windover Man" roamed these woods. At the beautiful Swings you will appreciate the daring of more recent generations. 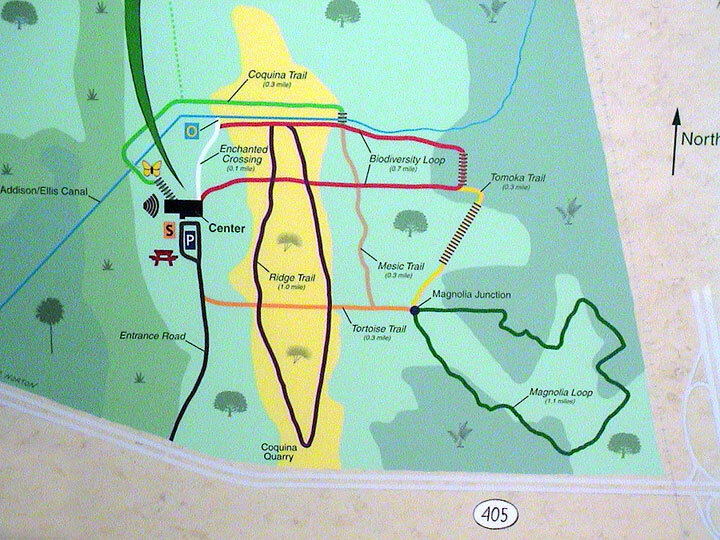 Walking & Learning trails wander through timeless Scrub, Mesic, and Hydric ecosystems with their wide variety of endangered and threatened species. You can feel as well as learn the subjects of your Natural Science class or Merit Badge requirements. Or, you can satisfy your desire to be enchanted by the overwhelming beauty of primitive Florida woods. Visitors to the 471-acre Sanctuary experience wildlife observation and diverse plant life on over 4 miles of hiking trails. The Management & Education Center offers hands-on Exhibit Room, Discovery Room, gift shop, reference library and restrooms. There is an outdoor, open-air butterfly garden and the screened porch and amphitheatre provide venues for outdoor education. Universal accessible amenities include an exterior covered porch, the Ancient Oak amphitheater, outdoor Butterfly Garden and a trail to a scenic overlook over the Addison Canal. A trained guide will lead you through the ecosystems and interpret the geology, native plants, the uniqueness of this sanctuary, as well as the historic and cultural sites that you pass. 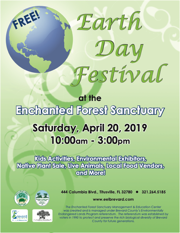 The 471 (originally 393) acre Enchanted Forest Sanctuary encompasses one of the last remaining large tracts of coastal hardwood forest in east central Florida. Its purchase was spearheaded by local community efforts. 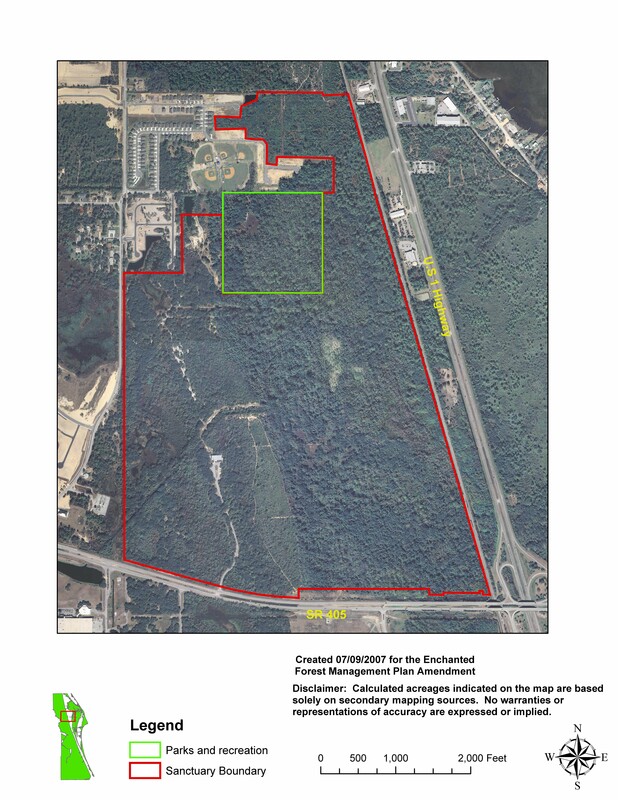 Acquisition became possible through the joint effort of The Nature Conservancy and far sighted Brevard County residents who imposed a tax upon themselves to create the county's Environmentally Endangered Lands (EEL) Program. Florida's Preservation 2000 Program and Conservation and Recreation Lands (CARL) Program have offset some of the costs. WebSites that Friends of the Enchanted Forest should know about. Click for a huge map. Out There - Outdoor experiences in the Titusville area. • Pictures of construction are posted here. to return to this page. to send us eMail anytime.